Notes: Expected Release: To be announced. From acclaimed game designer and illustrator John Kovalic and the award-winning My First LLC design team comes Double Feature, the action-packed, cinematic card game where players earn points by naming a movie that links elements from two Double Feature cards, with categories including Character, Genre, Location, Production, Prop, Scene, Setting, and Theme. For example, if the cards are "Black and White" (Production) and "New York" (Setting), correct answers could include anything from "King Kong" to "Manhattan"! 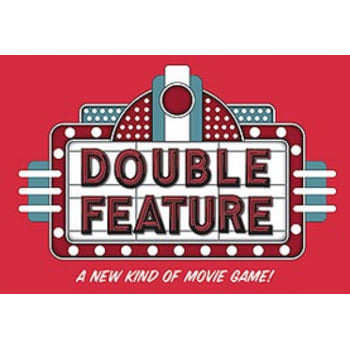 From the Silver Screen to contemporary Blockbusters, multiple answers to every card combo and thousands of combinations means the possibilities are endless in Double Feature!